MacXDVD today marked the official start of 2013 back to school deal, valid from now to Sep 30, 2013. This online event spotlights back to school giveaway, various DVD video converting software discount, etc to let all students, teachers, parents and institutions take full advantage of the back-to-school promotion before the bell rings. Today MacXDVD got a jumpstart on its annual back to school deal to help customers save more. Starting from now to Sep 30, 2013, this shopping spree involves first-ever giveaway of MacX iPhone DVD Ripper and up to 75% discount on MacX New School Year Gift Pack, MacX DVD Ripper Pro and MacX Video Converter Pro, eligible for students, parents and teachers. More than expected, there are also special deals for schools and institutions, which are qualified to get volume academic license with up to 90% off during back to school promo this fall. According to NRF's 2013 Back-to-School Survey, 36.6% of school shoppers will turn to internet to save money and do more comparative shopping online as a result of tighter economy. With sincere wish to help budget-conscious customers out, MacXDVD initiates back to school online shopping revelry ahead the fall semester. This 2013 back to school deal is eligible for not only parents, teachers and students but also schools and institutions with the following great offers. 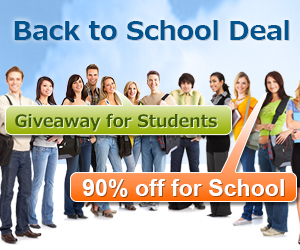 The software in MacXDVD Back to School Sale 2013 includes MacX DVD Ripper Pro, MacX Video Converter Pro, MacX New School Year Gift Pack, with up to 75% off. Aside from big discounts, MacXDVD awards parents, teachers and students with free-licensed MacX iPhone DVD Ripper upon sharing the back to school promo on Facebook. All these gifts allow individuals to rip DVD, download YouTube and convert video to MP4, FLV, AVI, MOV, etc for playback on iPhone iPad Android easily after class time. For individuals who have channel to sell products via blog, website, etc, it’s a golden chance to raise revenue by participating in MacXDVD affiliate program, up to 50% initial commission per sale. MacXDVD also highlights academy license program during the back to school deal to benefit schools, districts and institutions, which are on a roll to get multiple copies with up to 90% discount on DVD video converting software package, DVD ripper for Mac and video converter for Mac. One thing needs to be notified that the reseller contest is in full swing as another bonus for schools and institutions. 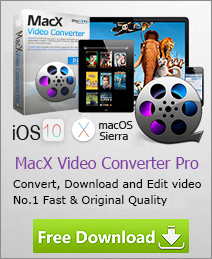 MacX iPhone DVD Ripper is regularly priced at $39.95. But this software is now $0 during the back to school promotion. Individuals have the right to get the iPhone DVD ripper for Mac for free as long as sharing the 2013 back to school deal on Facebook before Sep 30, 2013. MacXDVD Software is a division of Digiarty Software Company, owns a professional multimedia software development team, providing a range of products for Macintosh Computer users, including MacX Video Converter, MacX DVD Ripper, DVD Author, DVD backup tools, etc, series of apps for Apple video player, and iPhone, iPad 2D and 3D video games. More information, please visit http://www.macxdvd.com.